Public art often gives a voice to the voiceless, and can be an outlet to tell others about their struggles, joy and celebrations. Harnessing the power to bring together individuals from all walks of life and unite them, here comes South Africa’s first International Public Art Festival (IPAF). To be held in Cape Town from 10 to 20 February 2017, the organisers hope to bring art and art lovers out of the galleries and on to the streets like never before. IPAF is one part of the mission of newly set up NPO Baz-Art to use art to brighten people’s lives in every way. The project goes beyond showcasing existing work to creating new work, making neighbourhoods more beautiful and safer, teaching children how to be creative and stimulating new businesses and creating jobs. In a nutshell the aim is to harness the power and creativity of art to improve people’s lives. The 10-day festival – which will be dedicated to teaching, creating and showcasing public art – will be the launch pad for various long-term projects. Children will be given art classes, neighbourhoods will be cleaned up and enhanced by large, maintained murals, unemployed people will be given training and entrepreneurs will be supported as they set up spin-off businesses such as food stalls or galleries. Baz-Art is the love child of relationships developed around another business – during the process of creating a craft beer, the founders of Baz-Art say, their eyes were opened to the power of art. The founders, Alexandre Tilmans and Sebastien Charrieras, decided to throw the combined force of their skills, experience and passion into a project designed to uplift artists while transforming the communities around them and helping local public art claim its rightful position in the global art world. Graffiti, street art and contemporary urban art festivals are blossoming around the world. Whether they see its roots in the San Bushmen’s ancient rock art or the powerful and passionate anti-apartheid graffiti of the eighties most people agree that public art’s time is now. 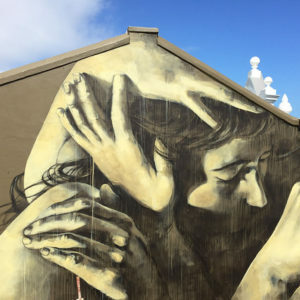 Cape Town is alive with festivals and fairs, and the art world is abuzz about the imminent opening of the Zeitz Museum of Contemporary Art Africa (MOCAA). Everywhere one turns there is public art, even in Cape Town where a municipal bylaw declares graffiti an illegal act. The festival is designed with three goals in mind: To position Cape Town as a global hub in the art world. To showcase the work of artists. To uplift communities and make their neighbourhoods more beautiful, happier, safer and more inspiring places to live. An initial budget of R3 million rand has been created for the festival, which will be a launch pad for various future projects that will ensure that public art has a respected place in society in general. The inaugural festival is timed to fall between two respected art events, the Cape Town Art Fair and That Art Fair. Attendees and artists from both events are encouraged to participate in IPAF, which will offer different art and inspiration from what is on offer at the more traditional art events. Baz-Art has the support of the local communities and authorities and a list that reads like the Who’s Who of the South African public art world have already expressed an interest in being involved. The inaugural festival will be focused on the district of Salt River. Each contributing artist will be given a space in Salt River to decorate as they choose. The murals will beautify the area, adding to Salt River’s unique character. Other activities include live painting by street artists, music, tattooing and face painting, and street food. The festival will also launch a programme of guided street tours. A second key part of Baz-Art’s work, to be officially launched during IPAF2017, is art classes for schoolchildren. 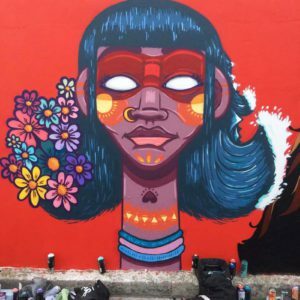 There’s a budget for artists to travel and take up residencies abroad, and there’ll also be a pan-European travelling exhibition of work by street artists designed to generate cross-cultural exchange.